Hello Friends! 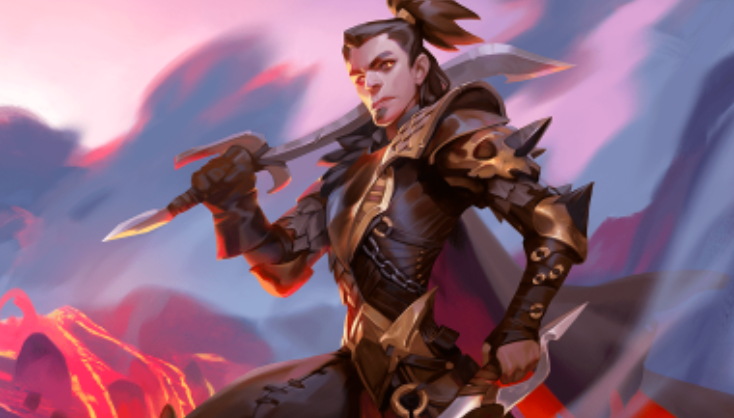 We have another sweet event on the horizon, so I am here to offer my regularly-scheduled “event primer” article, giving out some hot tips on how to approach this novel format. We have actually seen a similar event in the past, but that was back in September 2017, so a loooong time ago by Eternal standards. I have a ton of deck ideas to try out, but before we get into that I wanted to give a couple more general thoughts on how to approach building decks for an event like this. Let’s start with “top 8” tips to keep in mind when building decks and playing games! #8 Do something proactive – purely reactive decks are generally a mistake in wide-open metas. It is too hard to prepare for all the random stuff your opponents can throw at you. If you play a purely reactive deck you are very likely to run into something unexpected, and you will be caught with your pants down. You can still play a control deck, but you should make sure you have a good density of win conditions, and they start coming on-line on turn 5 or 6. #7 Cargo/Contraband are considered multifaction – these cards were very good at 1 cost, but now they are insane! Even 2-faction aggressive decks should consider playing Contraband as a 0-cost seek power. You should also remember that your opponent might be playing off-faction Contraband, so don’t get tripped up trying to figure out if your opponent is slow-rolling a faction. #6 Bad multifaction cards are not suddenly good – when we played this event last time there were a few people who advocated for all manner of unplayable multifaction 5, 6 and 7 drops, making some excuses about why they would be good now. This approach to deckbuilding was not particularly effective. The power level of the entire format has been levelled up, so bad cards are still bad. Special note – the Great Parliament is worse than it seems in the event. You can cast it on turn 3, but it doesn’t do anything. #5 Up influence density – 5 cost Heart of the Vault is very exciting, but it still requires FFFTTT influence, so if you don’t hit those influence requirements on turn 5 you haven’t really accomplished much. Diplomatic Seal and Waystones are a lot worse than usual, and don’t skimp on the Banners and Crests. #4 Don’t be afraid to play great mono-faction cards – Cards like Torch, Permafrost, and Sandstorm Titan are still amazing. While I would skew my deck to play more multifaction cards, don’t go overboard and warp your deck unnecessarily. #3 Cheap cards benefit from this event more than expensive cards – good deckbuilders should know that not all jumps in the mana curve are created equal. Given the way constructed games play out, the jump from 1 to 2 cost is way larger than the jump from 4 to 5. This encourages you to focus on packing your deck with cheap cards to maximize your cheating potential. #2 Prepare for aggro – point #3 isn’t exactly rocket surgery, so expect a lot of people to pack aggressive decks this weekend. This means you should either play an aggro deck with good tools for the mirror, or you should come up with an anti-aggro game plan. Cards like Hailstorm may not be multifaction, but they will still be excellent in the event. #1 Rindra’s Choice is broken in half - Like… read the card. Think about it. This card is stupid in this event. Absolutely insane. I can’t properly describe how good this card is. Make an effort to fit as many copies in your deck as possible. Some other cards get similarly interesting buffs, like Equivocate, Banish, Defiance and Shakedown, but Rindra’s Choice is #1 on that list. OK, with these top 8 tips out of the way, let’s take a look at some decks! Ok, we are going to start with some of the more obvious decks, and work our way to some of the more exotic. Haunted Highway is a very competitive deck that happens to run a ton of multifaction cards. You could probably play DrPringles’ list from last weekend’s ETS without any changes and do totally fine in the event. I have made a few changes, like dropping the Dusk Raiders in favor of cards Gorgon Fanatic, as well as finding space for 4 copies of Rindra’s Choice between main deck and the market. If you wanted to get really funky I would take a look at Scraptank, as this card is now “screamable” which is very cool. Winchest is another deck that falls under the category of “extremely good, and happens to play a lot of multifaction stuff”. I made a few minor changes to SecondBlue’s list from last weekend, like swapping Maiden for Highwayman, but this isn’t even necessary. It is hard to tell what exact approach to building Winchest will be best in the event, but this seems like a decent place to start. For the final installation of the “totally obvious” decks, I felt that Jennev was pretty attractive. 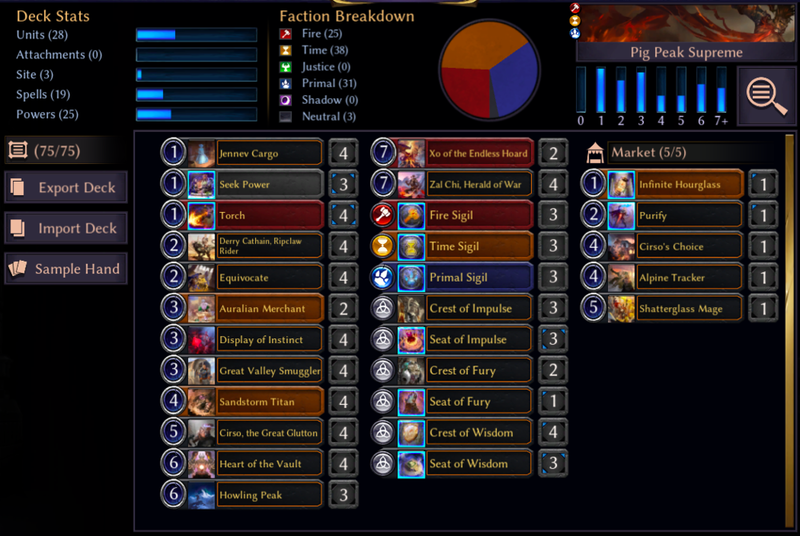 This particular list is a riff on JockeD’s “Pig Peak” deck, as it fits in more multifaction threats like Cirso. I am honestly worried that a deck like this will be too slow for the event, but you can adjust by moving Purify to the main deck, or finding space for some copies of Hailstorm. Stand Together and Alessi are stupid good in this event. Being able to play out any numbers of Alessi while holding up Stand Together for only 2 power is absurd. This “combo” is one of the few things that competes with Rindra’s Choice, so it has my attention. Beyond that, there are a ton of extremely pushed multifaction units that can easily fill out a curve. I am worried that this particular version of the deck might be a bit threat-light, but it is hard to tell without testing it. Three faction decks are going to be very popular this weekend, but two faction is also totally playable! Champion of Glory, Whirling Duo, and even Fearless Nomad are very attractive when you are getting them on discount. 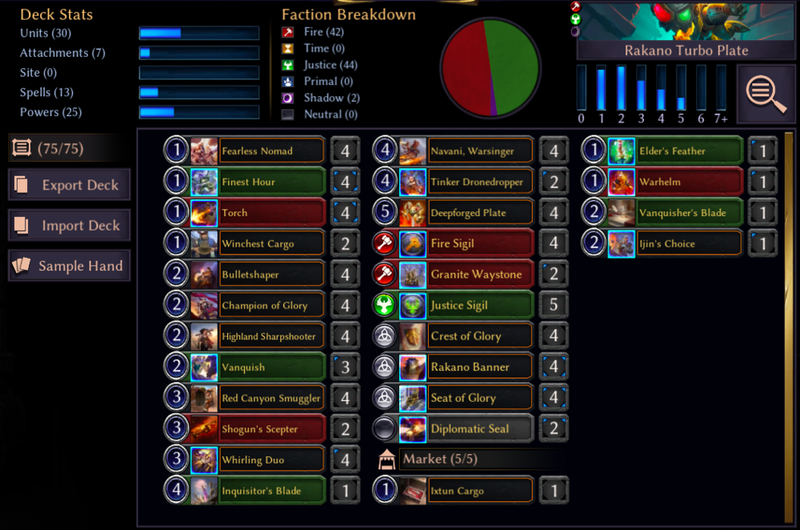 This particular build of Rakano is attempting to maximize the use of Deepforged Plate by playing a full 4 copies, as well as Bulletshaper to power them out early. This approach is a bit risky in the face of Rindra’s Choice, but you can very easily steal some wins. There are lots of alternative builds that are viable, but this is one starting point that interests me. Straight Argenport doesn’t look insane, but there are a few wrinkles that I find interesting. One of the major draws is Anointer of the Faithful, as it is functionally free if you get to bond out another unit. Sequences like turn 1 Anointer, bond out a second anointer, and then bond out a Crownwatch Paladin is completely filthy. It’s not going often, but it is always nice to have a dream. Auralian has some sick removal for this event. Look at it! 1-cost Equivocate! Rindra’s Choice! Banish! This deck looks amazing at not dying for 8 or 9 turns, but it’s not great at ending the game. Azindel is technically a win condition, but I am not excited about it. I am pretty sure there is something here though. Outside of Rindra’s Choice Feln doesn’t get much that is crazy. 4 cost Champion of Cunning and 5 cost Black Sky Harbinger are not exactly insane. Still, there are a handful of nice upgrades, plus you get access to a ton of nice anti-aggro cards like Hailstorm. I’m not sold on what to do with the last couple slots, so I just threw Mirror Image in, as that card is rarely bad. Another card that may be worth including is Steely Resolve, as it is a 0-cost protect effect for all the Cargo, Torch, Haunting Scream, Rindra’s Choice, and more. As I have said before, I have something of a weakness for Cradle decks. This is similar to one I have been playing on the ladder, but have obviously packed it with maximum Rindra’s Choice. Similar to Feln, I don’t think this deck gets a ton from the event bonus, but you are a very good anti-aggro deck, which could be good enough. These decks are really just scratching the surface of the possibilities. TJP midrange seems good. Stonescar Aggro seems good. Maybe there is some kind of Screaming Tavrod deck that is playable. Lifeforce might be dank. Skycrag is also totally fine. The possibilities are extremely open! You might even want to juke players overloading on Rindra’s Choice while ditching Annihilate to play something boring like Praxis! There are a lot of possibilities, but the only thing I know for sure is that this will be a lot of fun! Thanks for joining me! Were there any decks that you think I missed? Archetypes you are curious about? Let me know what you though on the Reddit thread, or on social media. I also plan to stream my runs of the event tonight, starting around 9 or 10 EST, so be sure to follow me on Twitch or join the Discord so you know when I go live! Good luck in the event everyone!